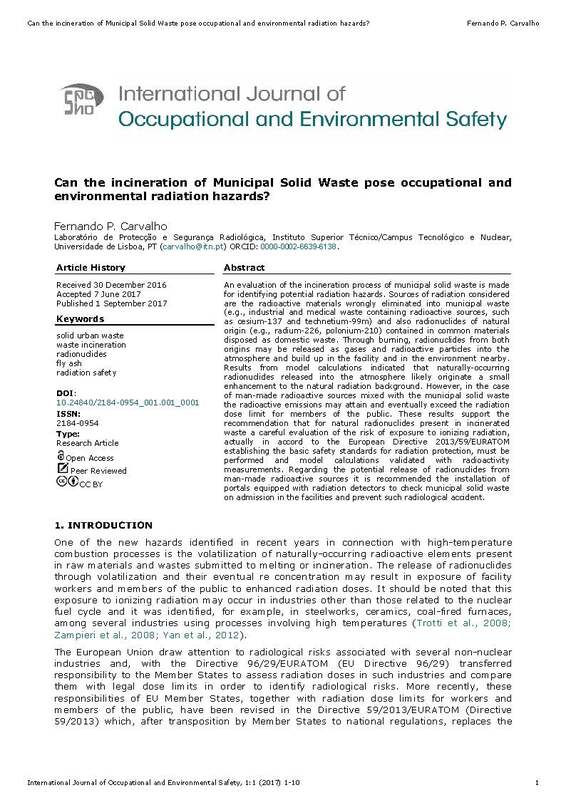 Can the incineration of Municipal Solid Waste pose occupational and environmental radiation hazards? An evaluation of the incineration process of municipal solid waste is made for identifying potential radiation hazards. Sources of radiation considered are the radioactive materials wrongly eliminated into municipal waste (e.g., industrial and medical waste containing radioactive sources, such as cesium-137 and technetium-99m) and also radionuclides of natural origin (e.g., radium-226, polonium-210) contained in common materials disposed as domestic waste. Through burning, radionuclides from both origins may be released as gases and radioactive particles into the atmosphere and build up in the facility and in the environment nearby. Results from model calculations indicated that naturally-occurring radionuclides released into the atmosphere likely originate a small enhancement to the natural radiation background. However, in the case of man-made radioactive sources mixed with the municipal solid waste the radioactive emissions may attain and eventually exceed the radiation dose limit for members of the public. These results support the recommendation that for natural radionuclides present in incinerated waste a careful evaluation of the risk of exposure to ionizing radiation, actually in accord to the European Directive 2013/59/EURATOM establishing the basic safety standards for radiation protection, must be performed and model calculations validated with radioactivity measurements. Regarding the potential release of radionuclides from man-made radioactive sources it is recommended the installation of portals equipped with radiation detectors to check municipal solid waste on admission in the facilities and prevent such radiological accident. The systematic assurance of the occupational health, safety and wellbeing of the employees may be accomplished through the implementation (and certification) of standardized occupational health and safety management systems in accordance with the requirements listed in the BS OHSAS 18001 standard. In Portugal the certification of occupational health and safety management systems is usually carried out against the requirements of the BS OHSAS 18001 and the NP 4397 standard which is a national adaptation of the former. 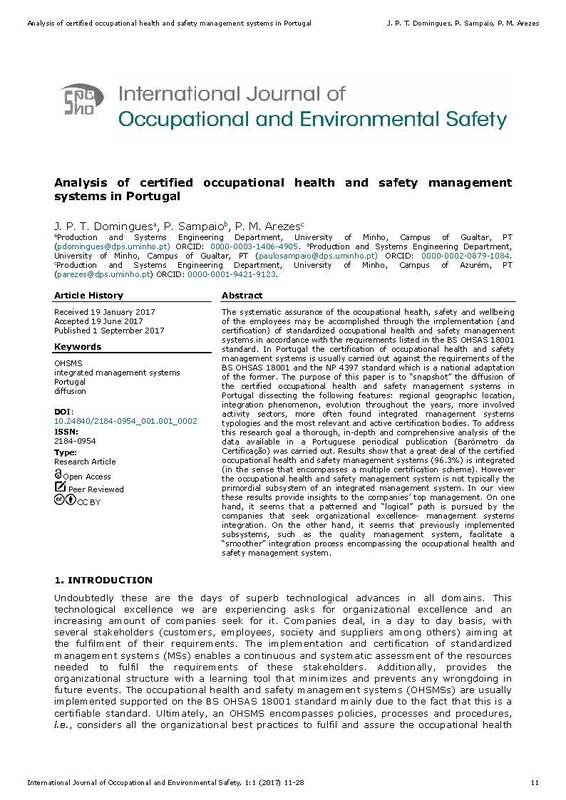 The purpose of this paper is to "snapshot" the diffusion of the certified occupational health and safety management systems in Portugal dissecting the following features: regional geographic location, integration phenomenon, evolution throughout the years, more involved activity sectors, more often found integrated management systems typologies and the most relevant and active certification bodies. To address this research goal a thorough, in-depth and comprehensive analysis of the data available in a Portuguese periodical publication (Barómetro da Certificação) was carried out. Results show that a great deal of the certified occupational health and safety management systems (96.3%) is integrated (in the sense that encompasses a multiple certification scheme). However the occupational health and safety management system is not typically the primordial subsystem of an integrated management system. In our view these results provide insights to the companies' top management. On one hand, it seems that a patterned and "logical" path is pursued by the companies that seek organizational excellence- management systems integration. On the other hand, it seems that previously implemented subsystems, such as the quality management system, facilitate a "smoother" integration process encompassing the occupational health and safety management system. Although corporate social responsibility is a permanent feature of activities of many companies, only a few companies can show a strategic approach and use complex solutions. It is emphasized that factors which could cause a positive change are institutional incentives such as tax benefits, and a bigger involvement of stakeholders, mostly employees. As far as providing hygienic working conditions is concerned, one must focus on better connecting occupational health and safety (OHS) with positive targets of the company, i.e. health promotion, efficiency increase and business excellence. It is becoming all the more important since the results of European research point out that the main source of stress at work is its psychosocial layer. Problems such as work-related stress, mobbing or discrimination are commonly considered to be the main challenges for OHS. 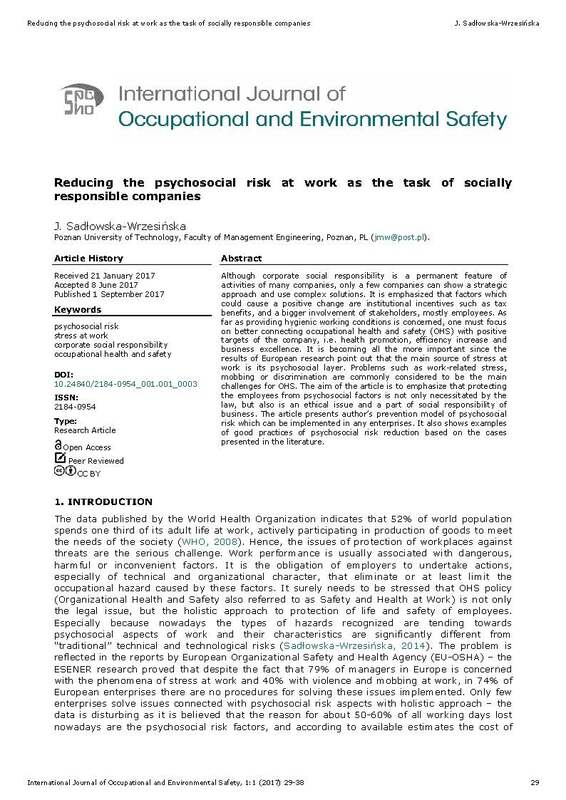 The aim of the article is to emphasize that protecting the employees from psychosocial factors is not only necessitated by the law, but also is an ethical issue and a part of social responsibility of business. The article presents author's prevention model of psychosocial risk which can be implemented in any enterprises. It also shows examples of good practices of psychosocial risk reduction based on the cases presented in the literature. 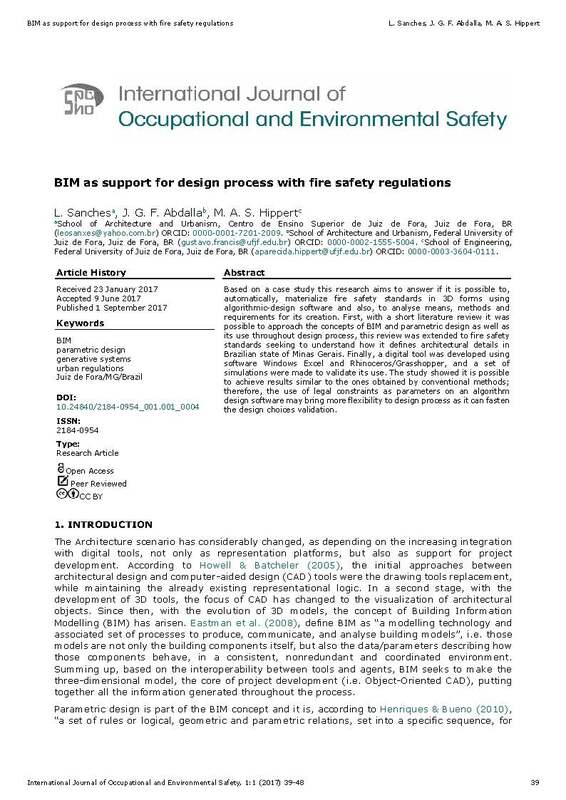 Based on a case study this research aims to answer if it is possible to, automatically, materialize fire safety standards in 3D forms using algorithmic-design software and also, to analyse means, methods and requirements for its creation. First, with a short literature review it was possible to approach the concepts of BIM and parametric design as well as its use throughout design process, this review was extended to fire safety standards seeking to understand how it defines architectural details in Brazilian state of Minas Gerais. Finally, a digital tool was developed using software Windows Excel and Rhinoceros/Grasshopper, and a set simulations were made to validate its use. The study showed it is possible to achieve results similar to the ones obtained by conventional methods; therefore, the use of legal constraints as parameters on an algorithm design software may bring more flexibility to design process as it can fasten the design choices validation. Musical instruments and singers' voices can reach high sound pressure values representing a risk to hearing health, which is of particular relevance for music teachers. 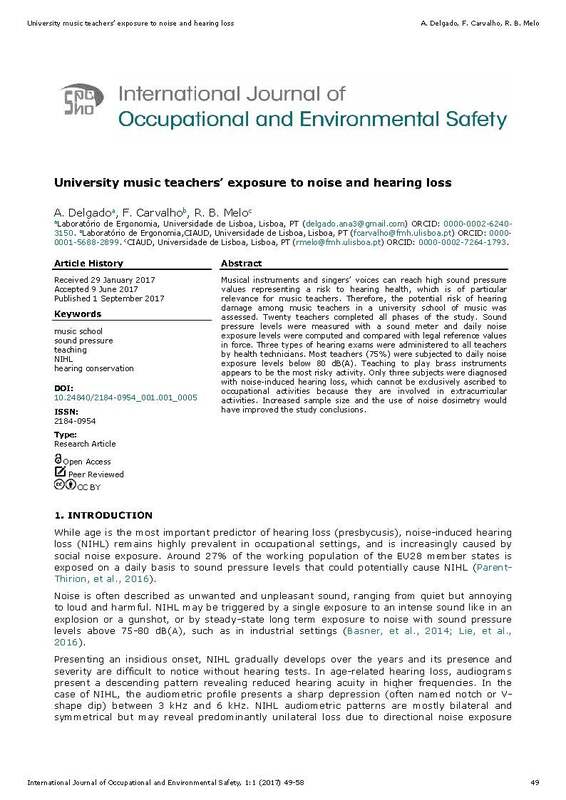 Therefore, the potential risk of hearing damage among music teachers in a university school of music was assessed. Twenty teachers completed all phases of the study. Sound pressure levels were measured with a sound meter and daily noise exposure levels were computed and compared with legal reference values in force. Three types of hearing exams were administered to all teachers by health technicians. Most teachers (75%) were subjected to daily noise exposure levels below 80 dB(A). Teaching to play brass instruments appears to be the most risky activity. Only three subjects were diagnosed with noise-induced hearing loss, which cannot be exclusively ascribed to occupational activities because they are involved in extracurricular activities. Increased sample size and the use of noise dosimetry would have improved the study conclusions. Assembly lines are related to health risks and work-related musculoskeletal disorders (WMSD), particularly of the neck and upper limbs (WULMSD). The assessment of perceived musculoskeletal symptoms is essential to WULMSD prevention, but studies in this field are lacking. A cross sectional survey on assembly line workers (n=270) was performed. 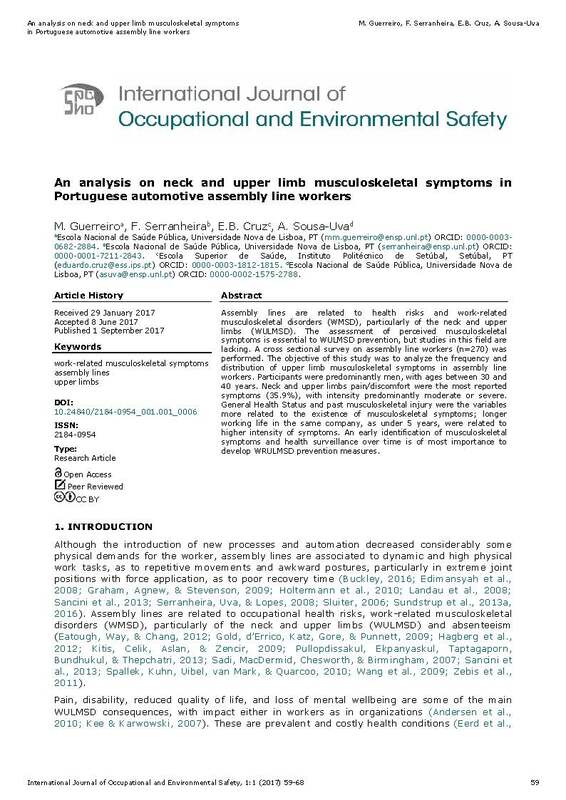 The objective of this study was to analyze the frequency and distribution of upper limb musculoskeletal symptoms in assembly line workers. Participants were predominantly men, with ages between 30 and 40 years. Neck and upper limbs pain/discomfort were the most reported symptoms (35.9%), with intensity predominantly moderate or severe. General Health Status and past musculoskeletal injury were the variables more related to the existence of musculoskeletal symptoms; longer working life in the same company, as under 5 years, were related to higher intensity of symptoms. An early identification of musculoskeletal symptoms and health surveillance over time is of most importance to develop WRULMSD prevention measures. Shift work, especially if it involves night work and/or weekend work, may represent disadvantages for workers and their families at the level of family, social life, and health. The present study evaluates the impacts of three work shifts (morning, afternoon and night) on sleep, family and social life as well as satisfaction with work schedules. 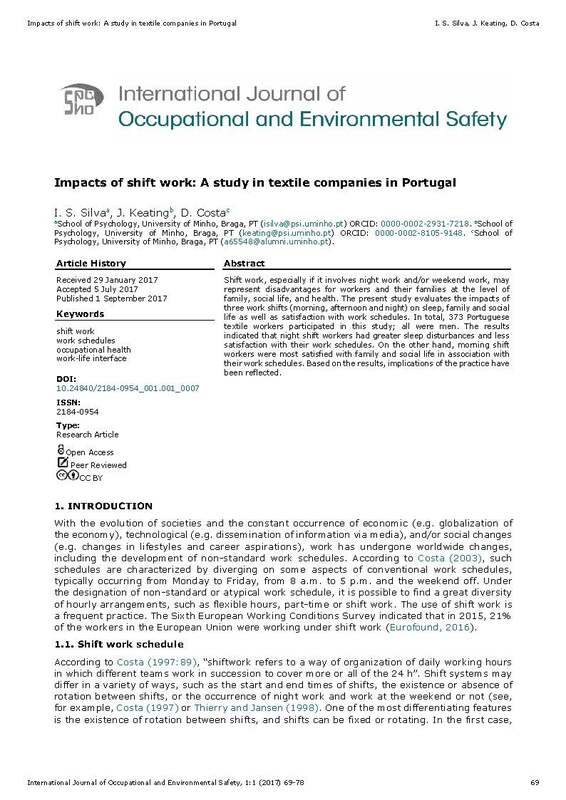 In total, 373 Portuguese textile workers participated in this study; all were men. The results indicated that night shift workers had greater sleep disturbances and less satisfaction with their work schedules. On the other hand, morning shift workers were most satisfied with family and social life in association with their work schedules. Based on the results, implications of the practice have been reflected. 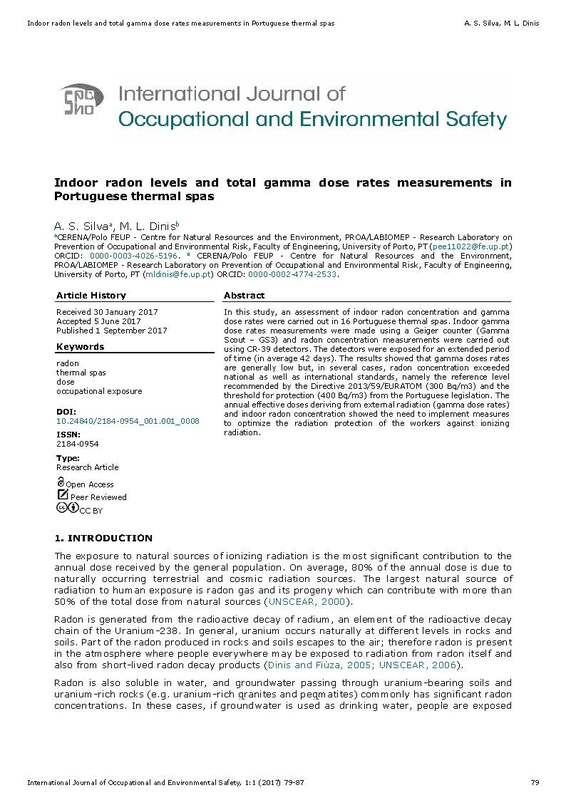 In this study, an assessment of indoor radon concentration and gamma dose rates were carried out in 16 Portuguese thermal spas. Indoor gamma dose rates measurements were made using a Geiger counter (Gamma Scout â€“ GS3) and radon concentration measurements were carried out using CR-39 detectors. The detectors were exposed for an extended period of time (in average 42 days). The results showed that gamma doses rates are generally low but, in several cases, radon concentration exceeded national as well as international standards, namely the reference level recommended by the Directive 2013/59/EURATOM (300 Bq/m3) and the threshold for protection (400 Bq/m3) from the Portuguese legislation. The annual effective doses deriving from external radiation (gamma dose rates) and indoor radon concentration showed the need to implement measures to optimize the radiation protection of the workers against ionizing radiation.